Ready, set, go! Assembly requires no tools, simply fold out hinged panels, then snap them securely in place. This compact unit holds an entire PC system using only a minimum of floor space. 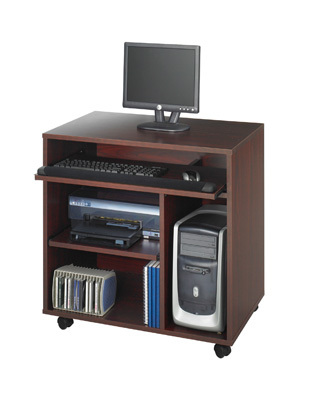 Features slide-out printer and keyboard/mouse shelves, plus a spacious 9 3⁄4"W x 18 7⁄8"D x 21"H vertical CPU storage area. Keyboard/mouse shelf measures 29 1⁄8"W x 11 3⁄4"D, and the printer shelf is 18 1⁄2"W x 14 3⁄4"D. Includes a lower 19 1⁄2"W x 18 7⁄8"D x 10 1⁄4"H compartment for additional storage. Mobile on four swivel casters (2 locking). Furniture grade wood with durable laminate finish in Mahogany (MH). Assembles easily in minutes.